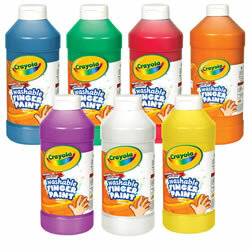 Find washable, nontoxic paint that will entertain children for hours. 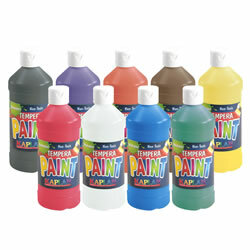 Kaplan provides tempera paint, finger paint, glitter paint, watercolor paint sets, and more in an assortment of colors. 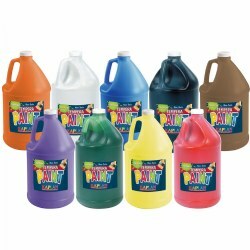 Products also include gallon pump dispensers, splash mats, and tempera mixing medium. Add the convenience of washability to Kaplan's high-quality paint. It won't streak, crack, or rub off and dry to a satin finish, and they're so thick you may even want to add water for additional mileage. All Kaplan Kolors carry the AP seal (non-toxic). 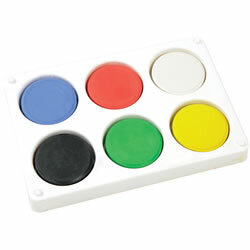 The set of 8 colors include: orange, white, green, black, purple, blue, yellow, and red. 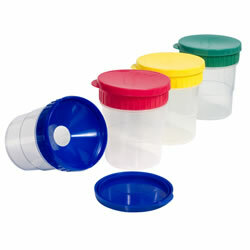 The set of 6 colors include: orange, white, blue, green, yellow, and red. Made in the USA. Add the convenience of washability to Kaplan's high-quality paint. It won't streak, crack, or rub off and dry to a satin finish, and they're so thick you may even want to add water for additional mileage. All Kaplan Kolors carry the AP seal (non-toxic). Made in the USA. 4 years & up. 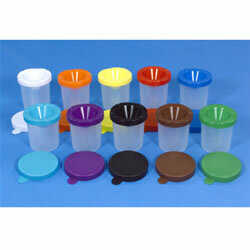 Tempera cakes in 6 bold colors complete with durable molded palette. Cakes measure 2 1/4" x 3/4". 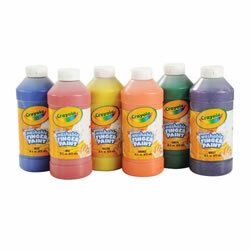 These heavy-bodied, vivid finger paints are rich, creamy, and water-soluble making clean-up a breeze! AP (non-toxic). Made in the USA. 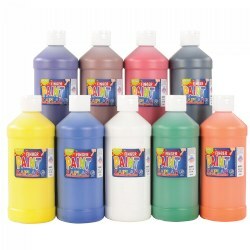 Smooth, heavy consistency is ideal for learning finger painting, techniques or experimenting with color and texture. Paint won't crack or rub off when dry. AP (non-toxic). Violet, red, orange, yellow, green and blue. Set includes one of each. 3 years & up. 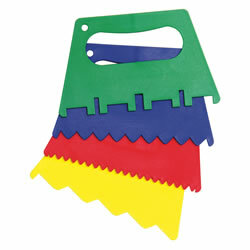 A set of 12 durable plastic paint scrapers with four different designs. 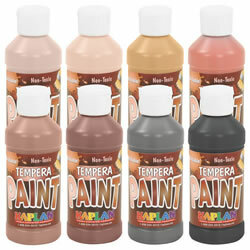 Kaplan's high-quality tempera paint won't streak, crack, or rub off. 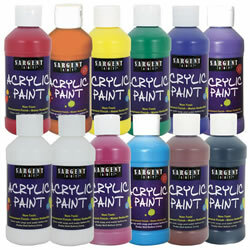 Vibrant colors dry to a satin finish, and they're so thick you may even want to add water for additional mileage. All Kaplan Kolors carry the AP seal (non-toxic). Made in the USA. 3 years & up. 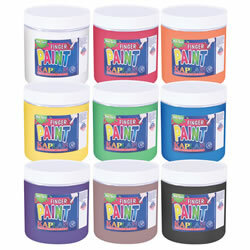 Each 3 1/2 inch non-spill paint pot has inner safety lid, brush rest and top cap. Brushes and paint sold separately. 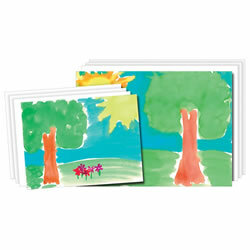 Acrylics can be used for a variety of painting techniques. Opaque colors combined with a permanent coverage makes this paint perfect to use on many surfaces including canvas and other art projects. 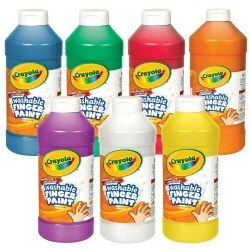 Set of 12 includes: yellow, orange, red, magenta, violet, blue, turquoise, green, black, brown, and 2 bottles of white. Acid Free. 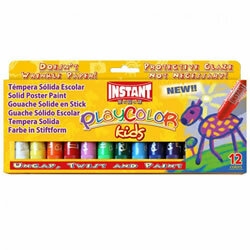 The first truly washable finger paint! 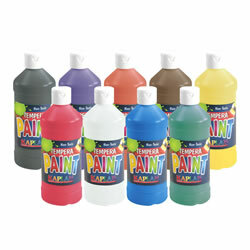 Smooth, heavy-bodied consistency is ideal for learning finger painting techniques or experimenting with color and texture. Paint won't crack or rub off when dry. CP (non-toxic). 3 years & up. 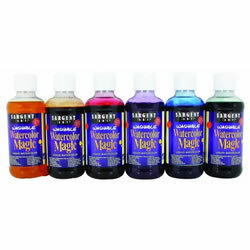 A unique way to experiment with tempera paint without the mess of water, paint cups or brushes! Easy to use, just uncap, twist and paint. 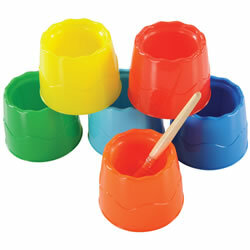 Great for painting on paper, cardboard, wood, canvas and more! The bright, vibrant colors dry quickly, won't crack when dry and can be applied lightly for pastels and harder when more color is needed. 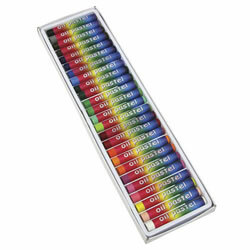 Box of 12 colors: white, yellow, orange, red, pink, light green, dark green, sky blue, dark blue, purple, brown, and black. 3 years & up. 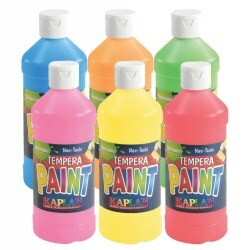 Bring on the brilliance of lively fluorescent colors to Kaplan's high-quality tempera paint. It won't streak, crack, or rub off and dry to a satin finish, and they're so thick you may even want to add water for additional mileage. All Kaplan Kolors carry the AP seal (non-toxic). Comes in 16oz. bottles only. Made in the USA. 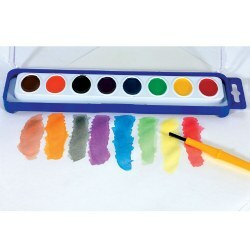 Smooth, heavy consistency is ideal for learning finger painting techniques or experimenting with color and texture. Paint won't crack or rub off when dry. AP seal (non-toxic). 3 years & up. 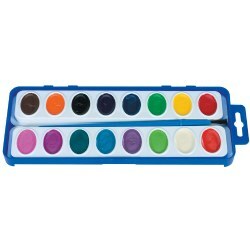 This set of 25 assorted brilliantly colored oil pastels blend and smooth easily by combining the permanence and luster of oils with the workability of pastels. The oil pastels measure 2" long x .33" diameter.